In January 1797 John Hetherington, a London haberdasher, was fined £50 for causing a public nuisance—he was wearing the very first top hat. In public! In February 1797 the very last invasion of Britain began. And ended. At Fishguard in Wales. In July 1797 Horatio Nelson was wounded at the Battle of Santa Cruz—he lost his right arm. Meanwhile, in the small Norfolk town of Acle, one Sarah Mutton was born to her unmarried mother, also named Sarah Mutton. In February 1817 the last major Luddite attack occurred, in Loughborough—against lace-making machines. In June 1817 Waterloo Bridge, in London, was opened. The following month novelist Jane Austen died—on 18th July. In December 1817 Mississippi was admitted as the 20th U.S. state. Meanwhile, back in that small Norfolk town of Acle, Sarah Mutton, now aged 20, married John Self-Browne, resident of the Norfolk parish of South Walsham St Mary. John’s brother Michael and his sister Susanna stood witness. John’s hyphenated surname presents a puzzle. At this stratum of society (the unwashed masses) it would usually be a name brought through from the mother’s previous marriage, or, indeed, was the mother’s maiden name, the implication being the child was illegitimately conceived. But John was the fifth child registered to the South Walsham couple of Michael and Elizabeth Browne, and none of his siblings shared that Self-hyphenation. Neither was he named for his mother’s family, for they were Dawsons. Whatever the reason for that hyphenated name, it seems John was proud of it. For when he and Sarah had their fifth child, a son, they named him the same: John Self-Browne. On 26th December 1853, this second John Self-Browne married Clarissa Baker, daughter of Henry Baker, publican at the Bush Inn, Costessey (coincidentally, a former watering hole of mine). This latter John (Self-) Browne begat a total of ten surviving children; initially resident at Costessey, later moving to the outskirts of Norwich, then (by the birth of the fifth child) to Cantley—a wee way away from his ancestral South Walsham, and from Acle. And, oh, surprise! his fourth child, one William Frederick Browne, was to become my great-grandfather. But I knew nothing of this family branch till late last winter. It fell as a great surprise that my great-great-grandmother had hailed from the very same village as me and yet my parents had moved there as newcomers after the war (in 1946). But then to discover this branch of my family had lived, worked, married and died not only close to where I now live (Great Yarmouth) but also that many of my favourite walks track through the very same parishes that formed the backdrop of their lives: Upton and South Walsham, Ranworth and Woodbastwick, Cantley, Buckenham and Blofield. And Acle, of course. And here is the spurious segue . . . 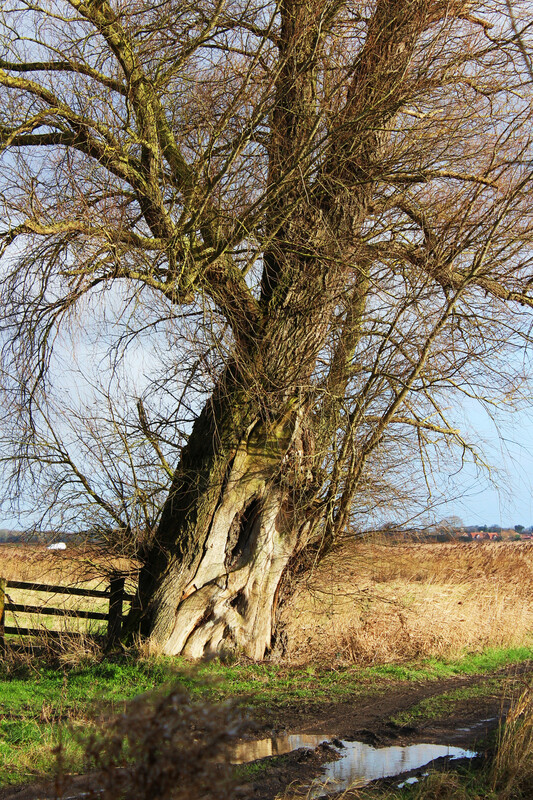 Being a short bus ride from Great Yarmouth—and while still oblivious to this branch of the family—Acle had become, for me, the start of many a ramble. But Acle is a town of two parts. The main portion, and probably the more recent, sits astride the A47, a trunk road that runs due west across the county to Kings Lynn and onto the Midlands beyond. Though marginally quaint with its Georgian architecture and round towered church (dedicated to St Edmunds), it is the probably older and southern part that interests me most. 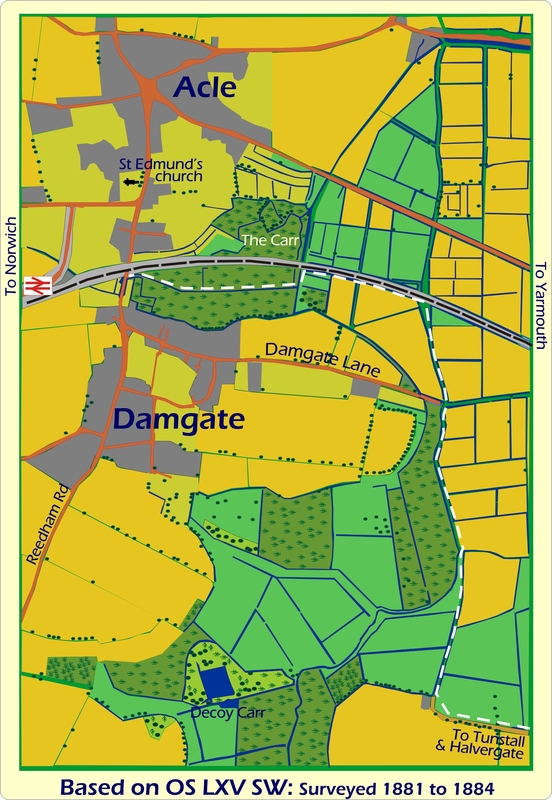 Set beyond the ‘new’ bypass and the not-so-new train line (opened 1883), this is Damgate. The ‘gate’ element is Scandinavian. But that’s hardly surprising for the entire area was heavily settled by Danes, though whether as part of the Great Army (late C9th), or as followers of King Cnut (early C11th), is uncertain. And while ‘gate’ is usually translated as ‘a way’ or ‘a street’ it can also mean literally ‘a gate’, as in ‘ingress’. 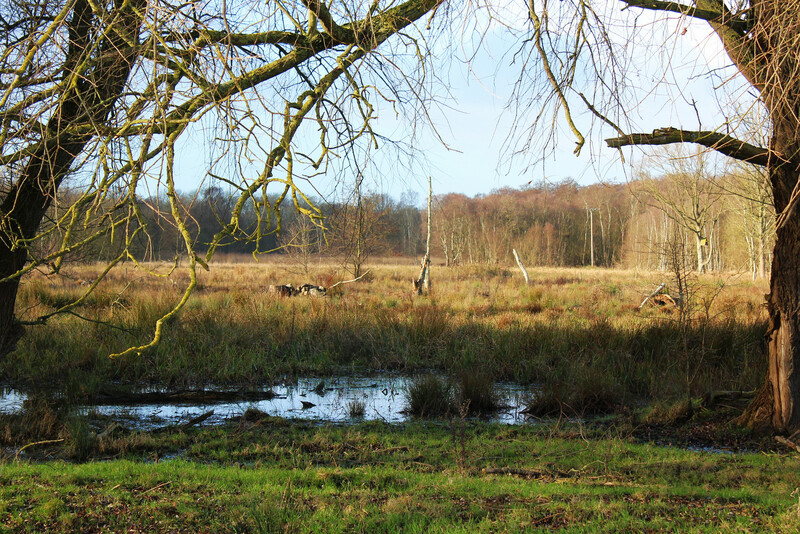 So, the way in and out of the dam, where ‘dam’ refers to an embankment raised to channel flood or sea waters—for Damgate gives onto the marshes, and those marshes, while offering sweet grazing, were only claimed from the sea in the medieval period. But, to return to the narrative . . . I bused out to Acle this last week and, for the first since knowing of Sarah Mutton and John Self-Browne, I headed to Damgate. Oh, not to roam around the roads, though I did wonder if my ancestors had lived in this part of town. 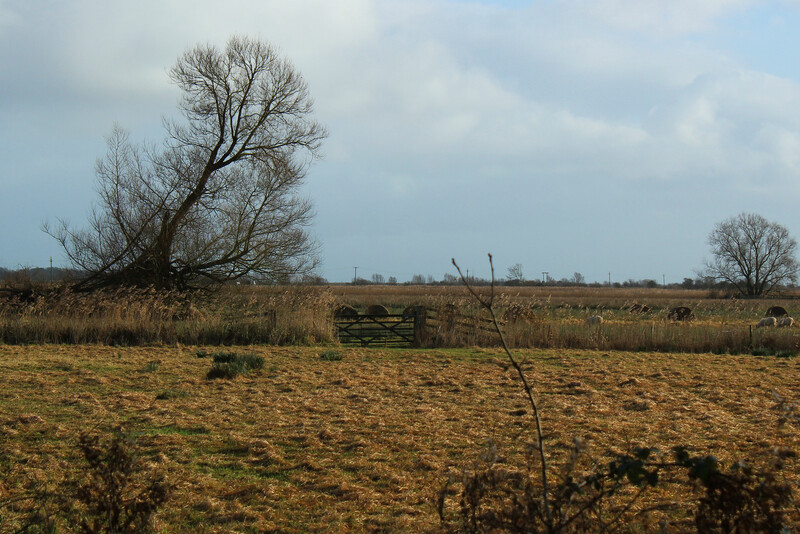 No, my interest was in Damgate Carr, 5.56 ha of wet woodland managed by Acle Land Trust. The obligatory map . . .
Over recent years the installed boarded walk and several bridges has made Damgate Carr a popular resort not only of local dog-walkers but also of various naturalists. 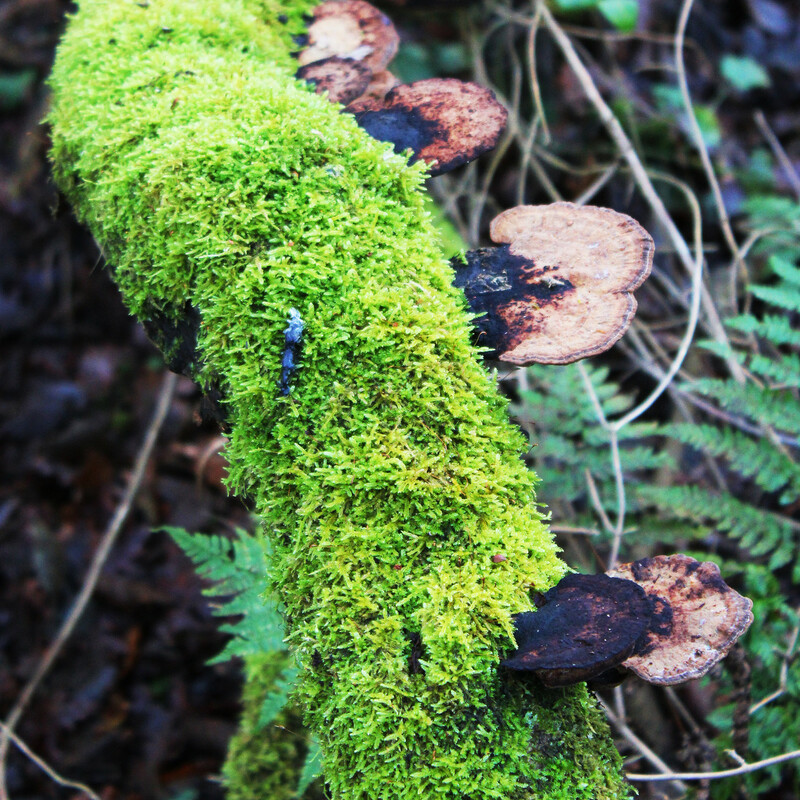 Apart from the possibility of catching a fleeting flash of the brilliantly plumaged kingfisher, the woodland is also an important site for fungi. Oh joy, what better place for me! Yet, oddly, I had never visited here in ‘fungus season’—because I had never before visited the woodland for its own sake. It had always been the start or finish of the 13 mile hike across the marshes—definitely not encouraging on a cold winter’s day. Yet I was intending to walk those marshes if only as far as Halvergate (see the map). I would then track back by road to Acle. As happened, I didn’t get that far (more of that anon). My first impression of Damgate Carr in winter . . . I had never seen it looking so brown and bare. Barren, I thought. But I hadn’t walked far along the path when, lo! 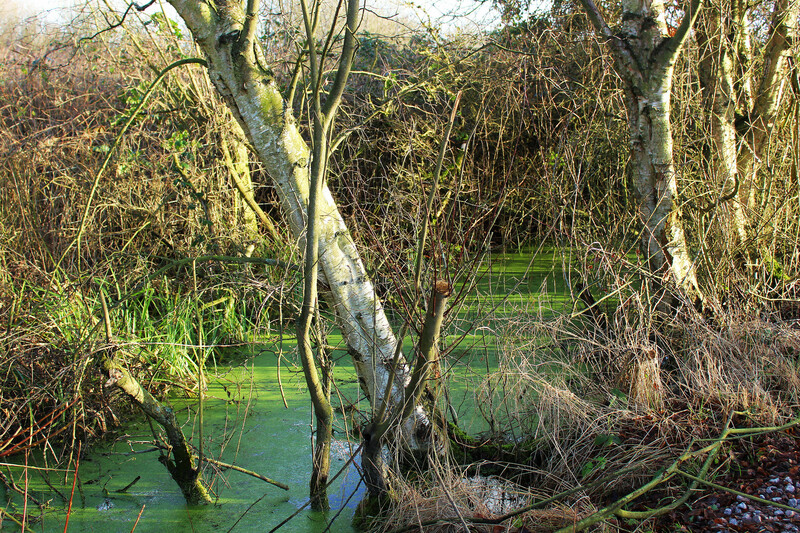 The woodland path wends its way through the trees, never straying far from Coleman’s Drain. No, I don’t know who Coleman was, whether local landowner or drainage engineer, but that is the name of this small watercourse. I’m reluctant to call it a stream despite some 2,000 years ago it was a small river, almost certainly tidal. 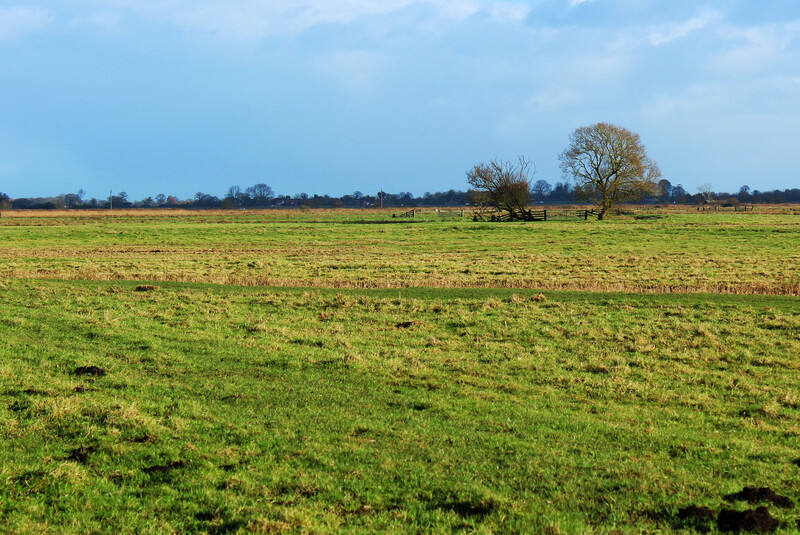 The marshes between the two Roman camps (Caister-on-Sea and Burgh Castle) had as yet to be formed from the extensive estuarine mud of ‘Gariensis’ (as the Romans called these mudflats; they remain in small part as Breydon Water). And it was probably as a sea-port that nearby Halvergate gained its name. By the time I had walked through the woodland I had taken in the region of 70 photos. 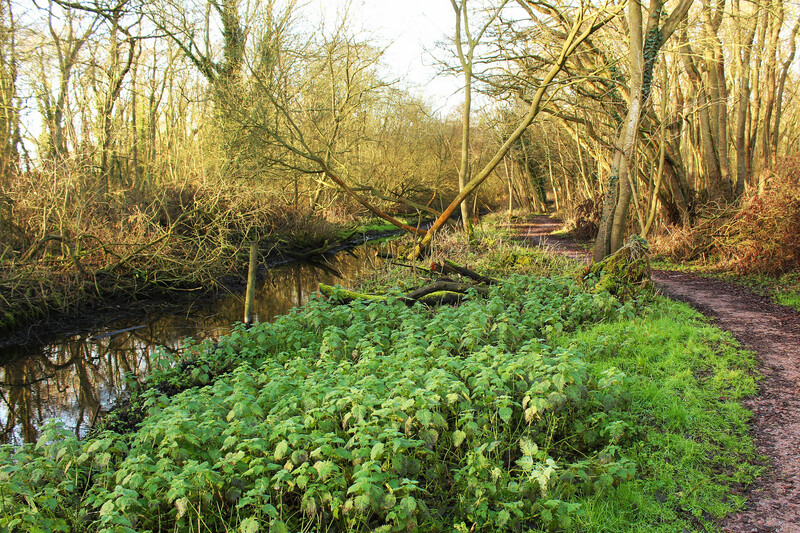 Beyond the woodland, the terrain drastically changes as footpath collides with long-distance track: Weavers Way runs alongside the Acle to Yarmouth embanked railway track, separated by a ‘ditch’. Well, I’d call it a ditch—my grandma would have called it a dyke, just to confuse us with the ups and the downs. 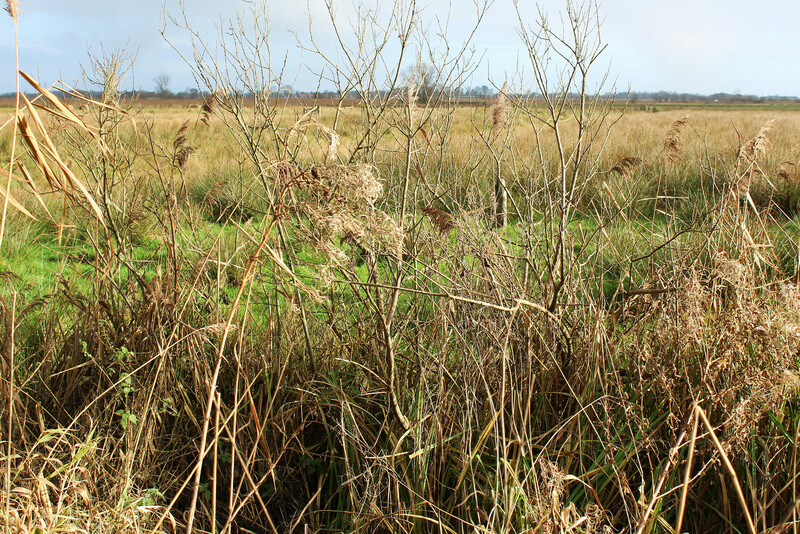 In fact, it’s one of the many—very many—watercourses (drains) that help to keep these marshes ‘dry’ and, well, drained. 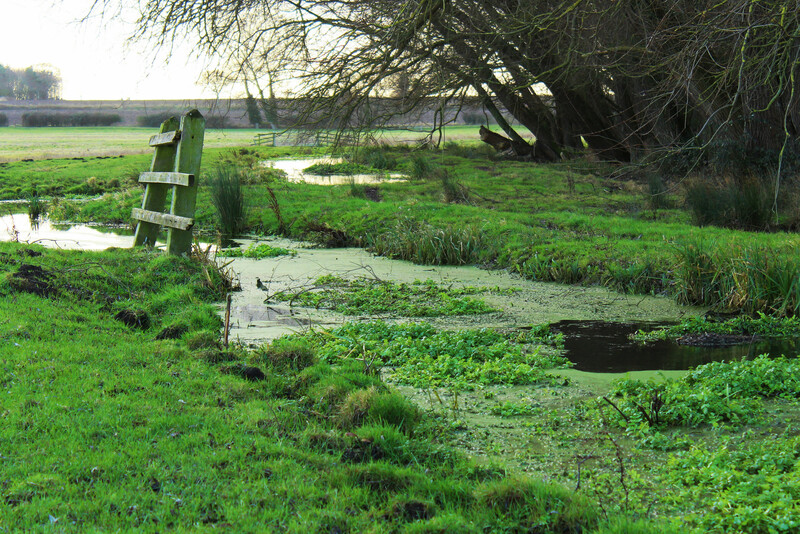 East of Damgate Carr, a drain runs alongside the railway embankment; favoured haunt of water voles! It was around here that the clouds, which had been mounting as they drifted in from northwest, let down the first of their dowses. Camera rapidly stowed away, I walked on. And on. Head down. Wondering the wisdom of continuing this walk. Wouldn’t it be better just to turn back? But I kept on walking. Stubborn, that’s me, though I’d say persistent. A while later the rain stopped. I fetched out the camera again. The long distance path, Weaver’s Way, crosses Damgate Lane just as Damgate Lane becomes a farm track, deeply pitted, muddily puddled. Uninviting. 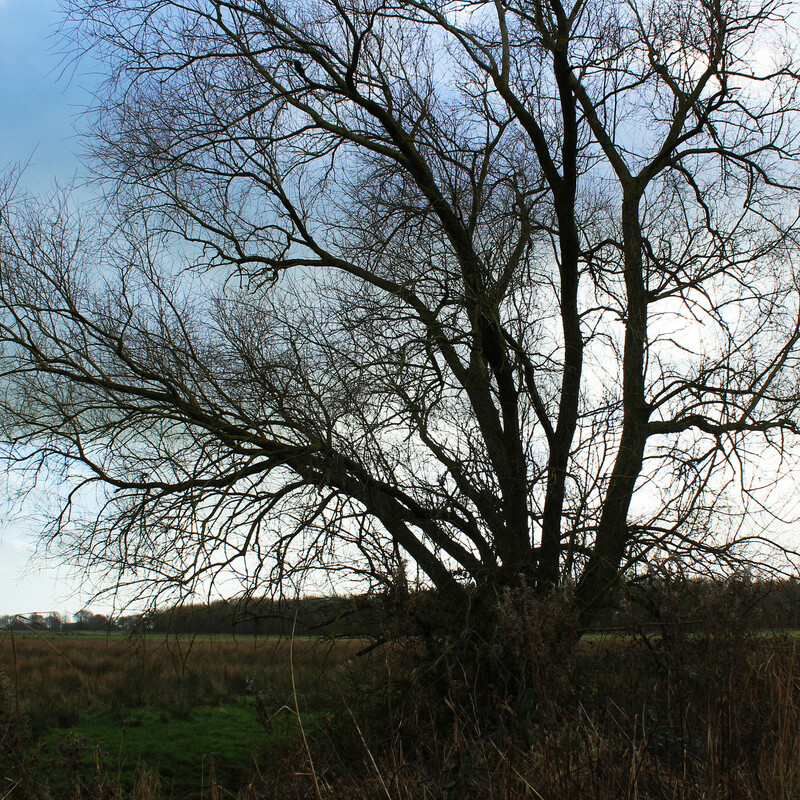 But this wonderful tree stands beside it as if a sentinel. I had to take its photo. Isn’t he magnificent? And so much more imposing with being naked. Oddly, this tree isn’t marked on the Ordnance Survey map of 1881-1883 (see map above), or at least not at this exact place. Yet clearly it must have existed then. It’s certainly more than 140 years old. I figure it’s the tree that’s marked further along the farm track. Yes, every one of the trees marked on my rendition of the OS map is exactly as it was recorded in 1881—except for those in the plantations, plus I haven’t shown any detail in the residential areas of Acle. The surveyors marked those trees for a reason. 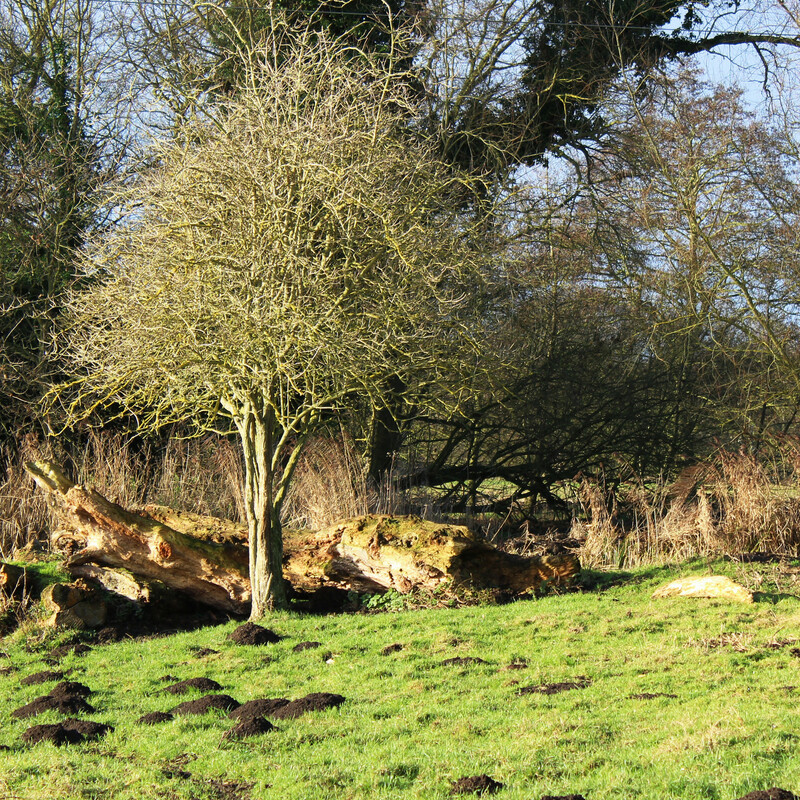 In their youth, these ‘timber trees’ had represented the future wealth of the landowners and farmers who had been encouraged to ‘plant a tree in ‘83’ (or whatever the year) as an investment against England’s later need. But unfortunately for them, the investment never paid out—for iron was soon to replace timber in the shipbuilding and construction industries. Still, in 1881 they were still considered important enough to mark on a map. Weavers Way follows the course of Coleman’s Drain as it changes direction, now to run north-south. 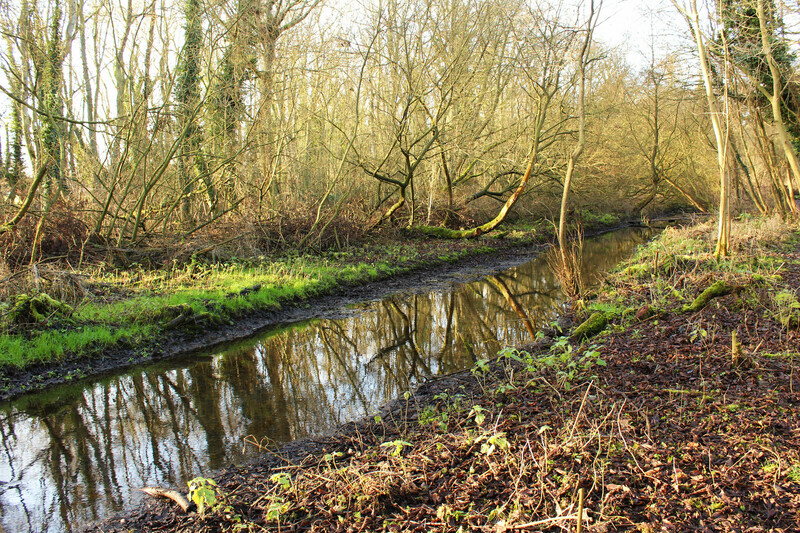 And here it soon morphs, from a canalised watercourse to something more resembling a stream. Sinuous. Snaking across the land. Note how the stream slithers and loops? The water weeds, here in abundance, are a sure sign that the water isn’t polluted. 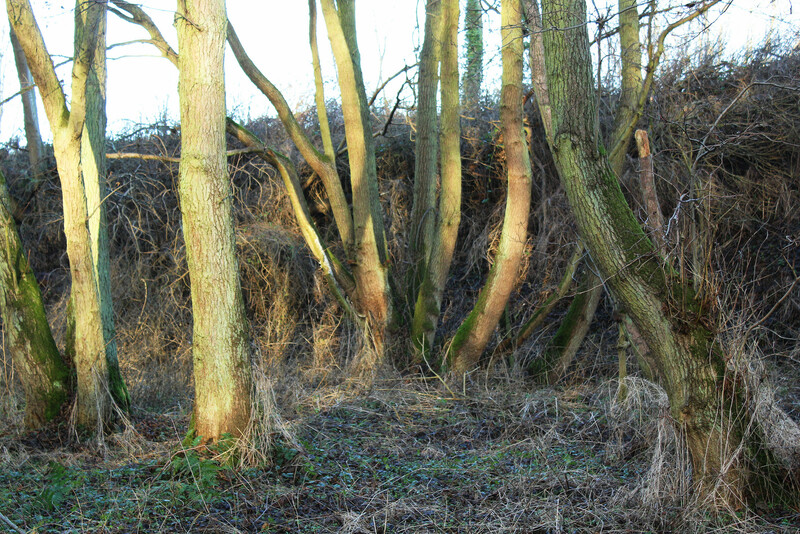 A ‘rusty’ woodland now can be seen to the west. Decoy Carr. Within Decoy Carr hides a duck decoy, used from 1620 till 1830 (see map above). The weather was still changeable; clouds veiling the sun one moment, streaming rays the next. But interesting conditions for landscape photography. 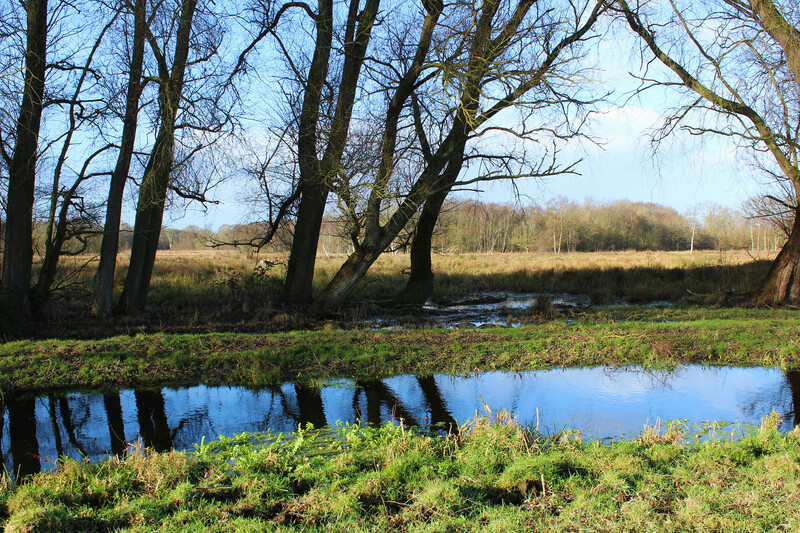 To me this and the next shot epitomizes our marshland. See that white ‘blob’ on the horizon? That’s a boat, way in the distance, on the River Bure. See this thorn tree in the next photo? I hadn’t seen this tree before. That’s odd, considering the times I’ve walked this path. But not so odd when considering where my attention had been . . . on the Drain and the trees and the wide-wide vistas. I should have paid more attention to where my feet trod. I was off-course. And that wasn’t the only thing. 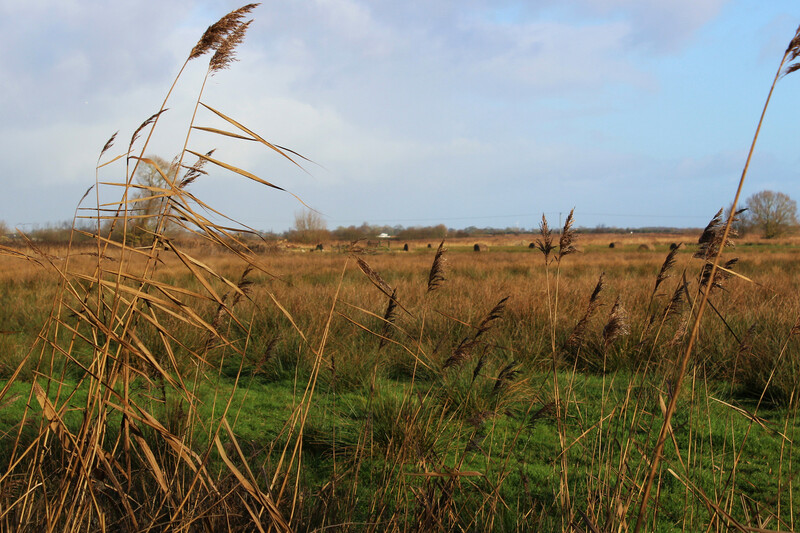 These marshes are grazed by sheep, horses and cattle. This particular field, I know, hosted cattle just this past summer. I know that for certain for I walked across it—following the correct path. And cattle have this thing of splattering their pastures with cow-pats. But where were the cow-pats? I could see none; all were gone. There was, however, some evidence of harrowing or raking—such as one might do to break up the dried pats and evenly distribute them. Good land management, that, returning fertility to the soil. I looked down at my feet. I do not exaggerate when I say I was standing on a good 4” of ‘mud’ that clung to the soles of my shoes, squishing its way up to mould around the uppers. It was a cold day. There was no smell. But when I finally found a strong enough stick to poke, push and pry away that extremely sticky, greenish mud, I found it to be exceedingly fibrous. So, not only had I taken a wrong turn but seeing the state of my shoes I wasn’t too keen on encountering yet more of that field. It was time to cut my plans and turn round. 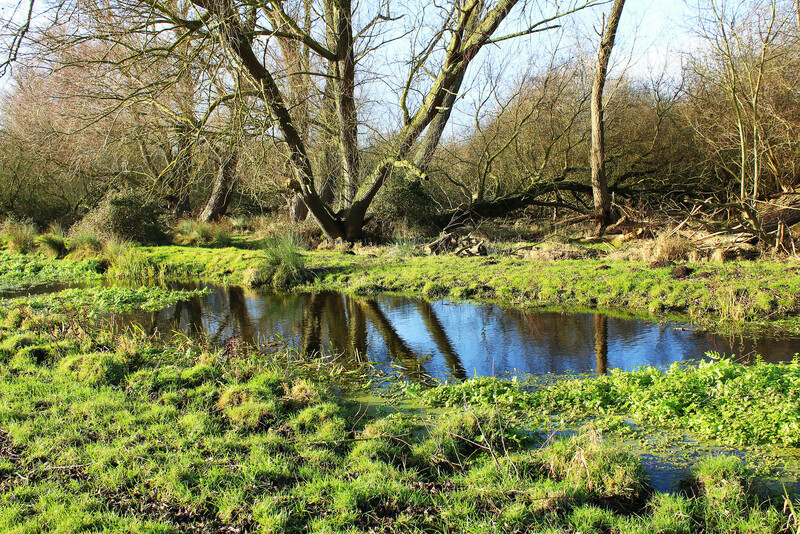 The weather stayed fair for me, producing deep reflections in the water: a favourite subject of mine. Was it the tree or the water that most attracted me here? 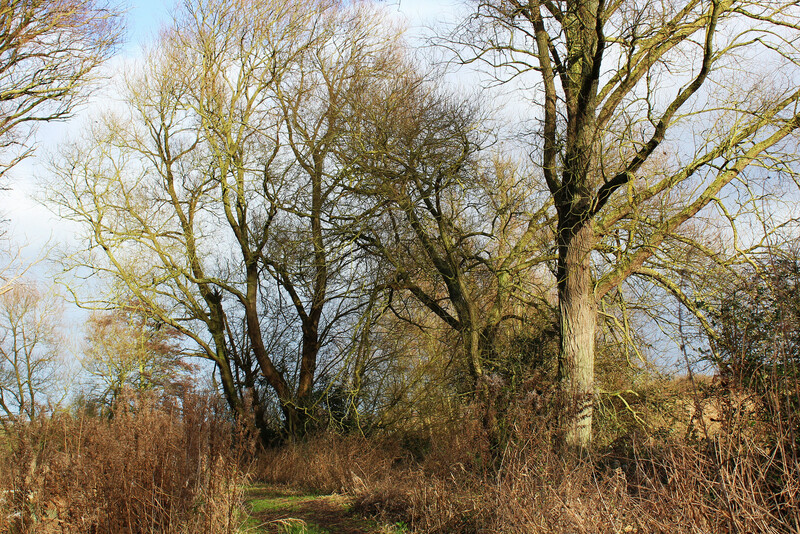 And I was able to take some amazing photos of the willows that line the path back. On the long trek back . . . I may not have completed my intended walk but I took sufficient photos to keep me busy with editing for the next few days. This entry was posted in History, Photos and tagged Fungi, History, Local History, Norfolk, Photos, Walks. Bookmark the permalink. I wanted to make the post more personal than a mere collection of photos. I had hoped those two dates (1797 and 1817) might coincide with local events (such as the opening of the Acle turnpike), but no. And so I had to search wider. I loved that bit about the top hat. Unfortunately, I couldn’t find more of that ilk. Still, it works. I did wonder about including the map but, as you know, I’m obsessed with maps, so why not. I wanted to show the maze of waterways required to keep the marshes dry enough for grazing. And I, too, particularly liked the shots on the way back. They provide a notable contrast with the earlier photos. 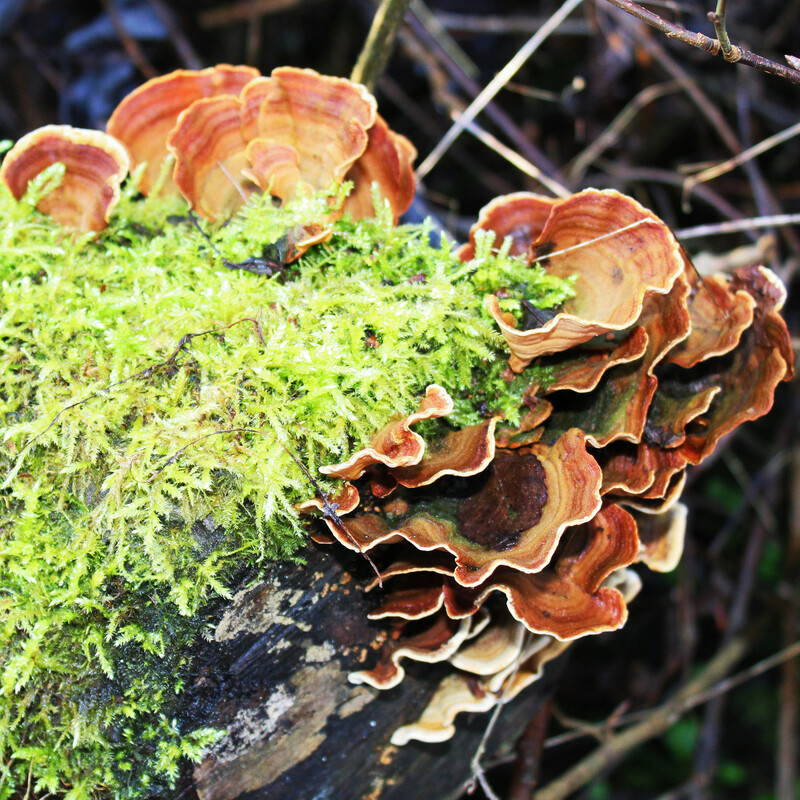 It’s amazing the amount of colour remains despite the starkness of Damgate Carr. But no comment of the fungi? 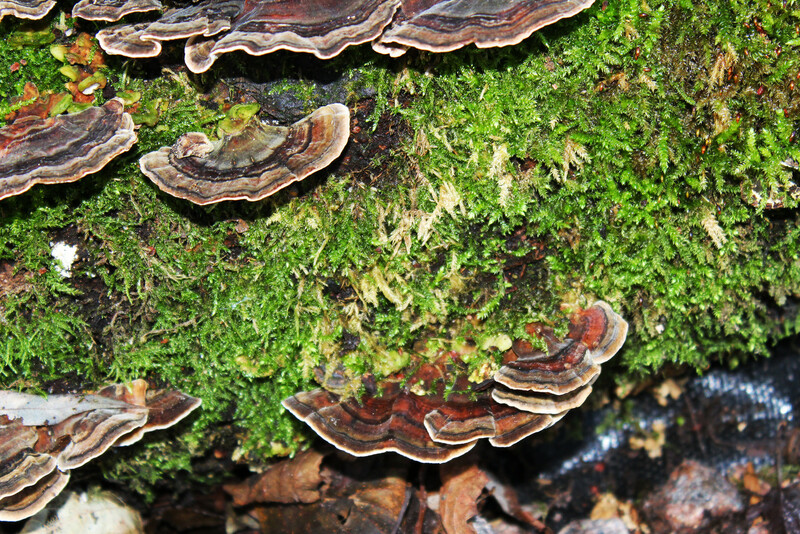 Those are the best fungi photos I have yet taken. I had no problem identifying the species either. Which all bodes well for next autumn’s fungi season! I’m a map fiend myself, so you’ll hear no complaints on that score. Well, my next ‘walks’ post should delight you. I’m currently working on the map! But fungi . . . they were such a delightful find, when all else was dreary (before escaping the woodland and venturing onto the wind-blasted marsh.) 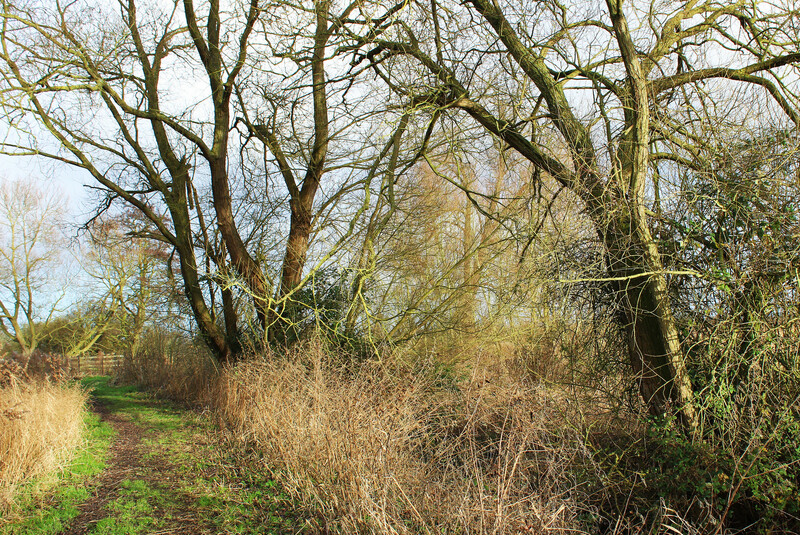 I had wondered whether to include the photos of the woodland. And yet that was a vital part of the walk. The idea was to record; not to win awards for beautiful photos. Though I do hope they’re at least balanced compositions. & BTW how was ARISIA? I’ll e-mail on the subject today.